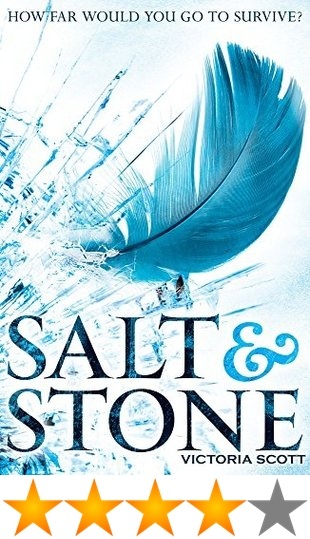 The second in the Fire & Flood series, as soon as I saw Salt and Stone was out I grabbed a copy. I loved the first one, so was really looking forward to the second one. And it did not disappoint. Head on over here to read my review on Fire & Flood. Don't worry, I don't think there are any spoilers in here. You're all good. Tella is still in the running to becoming America's Next Model the Brimstone Bleed, racing through treacherous terrains to win the Cure for her brother, Cody. After battling her way through Jungle and Desert, Tella and the friends and allies she's made along the way, along with their Pandoras - creatures given to them to help and protect them - begin the third and fourth terrains: ocean and mountain. With each part of the Brimstone Bleed becoming harder, with contenders dying on her every side, with corrupt members in leadership, and secrets being kept, Tella struggles to decide who to trust, how to use the resources they've been given, and how to win the cure for Cody. Once again, I really liked this book. I love the race that Scott has created and the characters she's included in the story. Like I said in my review of the first book, I really like Tella as a main character. More often than not the main character in a story erks me, but Tella is funny and sarcastic, and she is a wonderful voice for the story. If you're into your dystopian YA novels (think a kind of Hunger Games meets Maze Runner sort of story), pick up a copy of Fire & Flood and let me know what you think. I'm really looking forward to the next one (which I think will be the last one? ), although considering that Salt & Stone only came out this year, I will be waiting a while. What about you? Have you read this series? These sound awesome, definitely need to check out the first one! Seems like my sort of book and a protagonist that's not annoying - a rare but impressive find!